I heard Pasta saying this to our house-help/ her nanny. Needless to say, I was in process of making her favorite Fruits and Yogurt Popsicles. This was enough to make me smile for this little effort of making ice lollies for my munchkin! My little lady loves ice-creams and ice-pops and ended on requesting one or another almost every alternate day! When it comes to Pasta’s requests, Mehebub is nothing but a nutcase. He just can’t say no to his princes. Naturally, I have no option but to play the role of a strict mother! It is not that I don’t pamper her, however, I try to limit. For her typical food requests, I try to give her healthier treats. Pasta loves Yogurt and/ or Curd based edibles for that matter. Given the summer is here already, I started incorporating Yogurt/ Curd in her diet. she mostly grabs the Fruits and Yogurt Popsicles after returning from school or in the evening. This is actually my way of adding fruits and milk-product to her diet considering her preferences. 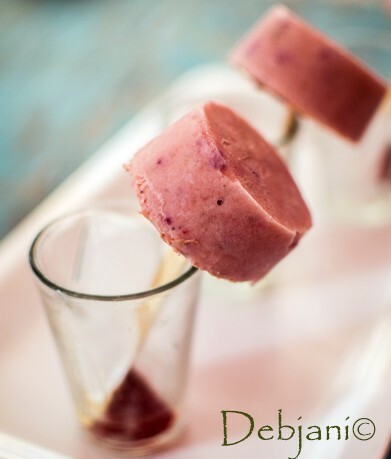 The Fruits and Yogurt Popsicles I make at home require hardly 15 minutes to combine the ingredients and a few hours to fridge. I mostly use a few seasonal fruits along with honey and blend those with the Fresh Yogurt to make the Breakfast Popsicles. 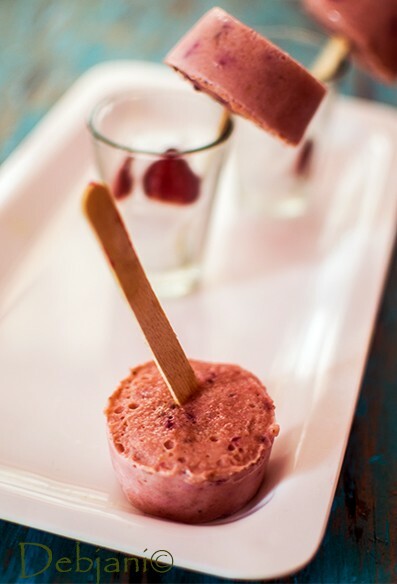 I make the ice pops using either Yogurt or Fresh Curd whichever available. 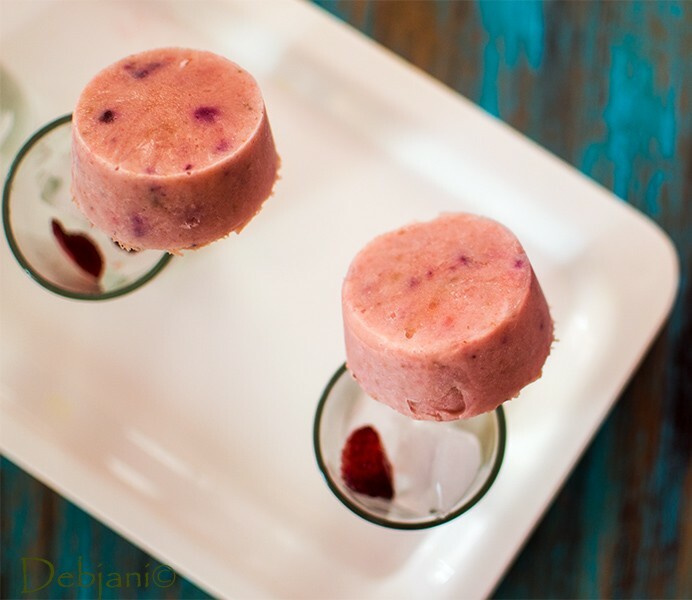 You can use either fresh Yogurt or Hug curd to make the Popsicles. I mostly make this once in a week using different flavors so that Pasta can grab her choice of posicles whenever she wants. though she is restricted to maximum 2 pops in a day. Here, for the reference of the readers, the difference between Yogurt and curd! Yes, you read it right. Yogurt and curd are two different things. Though, both are dairy products but prepared differently and taste different as well. Even, nutritional values are different. Both can be prepared at home from culture. Yogurt is prepared by adding the bacterial cultures to the milk; which are lactobacillus bulgaris and streptococcus thermophilus. Curd on the other side is having lactic acid bacteria or lactobacillus. Fridge the fruits for an hour before cutting. Fridge the Yogurt/ Curd as well. Peel (if required) and cut the fruits into small pieces. 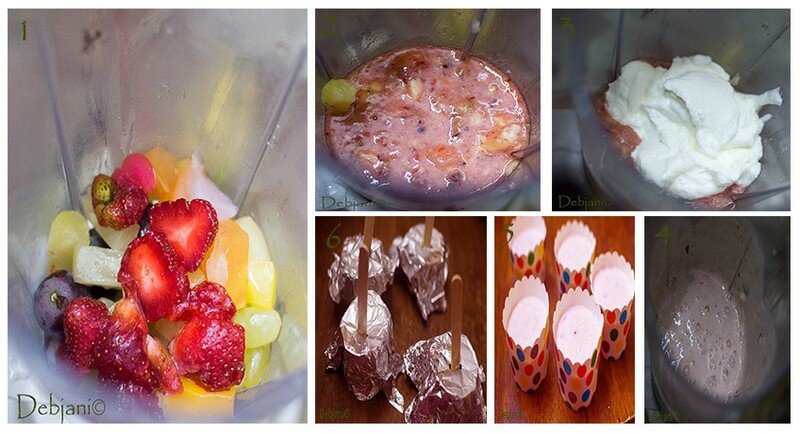 Take chopped fruits in a blender and blend in medium speed to make the puree. Now add Yogurt or hung curd whichever using along with the honey and blend once more. Pour the mixture into paper cups and fill ⅔ of each cup. Cover the top of each cup with aluminum foil and insert Ice-cream sticks.in the middle. Instead of paper cups, popsicle mould can also be used. Put the cups in the freezer and freeze for 5-6 hours. tear the aluminum foil once the popsicles set. De-mold in case of popsicle mould or tear the paper cup to serve the popsicles once set. You can replace honey with sugar and even increase or decrease the amount. 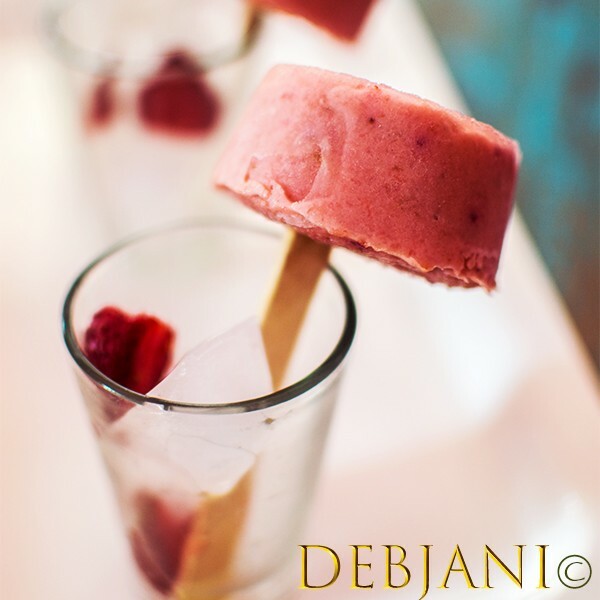 Have you tried the Fruits and Yogurt Popsicles Recipe from Debjanir Rannaghar! 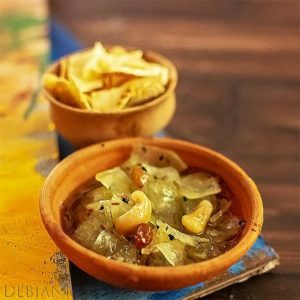 *This recipe is published in the Bengali Lifestyle magazine Sananda on March, 18.